[INQ. NO. 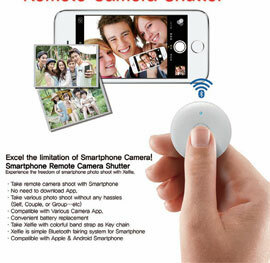 1508E12] Chois Technology’s XSC100 is a Bluetooth remote camera shutt er and is available with built-in camera apps. It perfectly supports built-in camera apps for iPhone and Android. So, various models of smartphone users have no need to download apps. It is compatible with various camera apps. The users conveniently replace the battery. Xelfi e is a simple Bluetooth fairing system for smartphone. And Chois Technology is a globally recognized company of the world’s fi rst brand of “X-Pointer “ that enables presenters to effectively present what they want to convey controlling the PC based on support of USB RF wireless communications. Since 2001, with the brand of X-Pointer, Chois Technology has been steadily releasing more upgraded wireless presenters, growing into the leading wireless presenter producing company in South Korea. The export performance of various models of X-pointer riding on steady good approvals from global major electronics-related exhibitions is being well publicized through such potential markets as Japan, Germany, Turkey, and the U.S.A. on a steady pace of growth. Now, it occupies the top spot in the South Korean market in terms of market share and technological leadership. X-pointer mobile, the world’s fi rst of its kind employing mobile functions, is a laser pointer using smartphones (mobile devices). Now, two versions – version supplying a function of touch pen with a form of portable case and another version providing clips are ready for its global customers. [INQ. NO. 1410E25] Chois Technology, this year, prepared its very attractive smartphone remote camera shutter called Xelfie (model:XSC100) for global smartphone users. 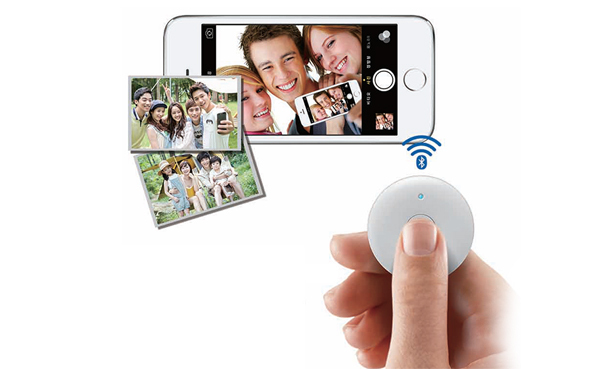 The XSC100 is a Bluetooth remote camera shutter and is available with built-in camera apps. It perfectly supports built-in camera apps for iPhone and Android. So, various models of smartphone users have no need to download apps. It is compatible with various camera apps. The users conveniently replace the battery. Xelfie is a simple Bluetooth fairing system for smartphone. X-pointer mobile, the world’s first of its kind employing mobile functions, is a laser pointer using smartphones (mobile devices). Now, two versions – version supplying a function of touch pen with a form of portable case and another version providing clip-are ready for its global customers. With this, presenters can perform their effective presentations anytime and anywhere with this innovative “X-pointer mobile featuring compact and simple design. This latest X-pointer mobile is now significantly assisting client companies to accomplish success in their important business fields. [INQ. NO. 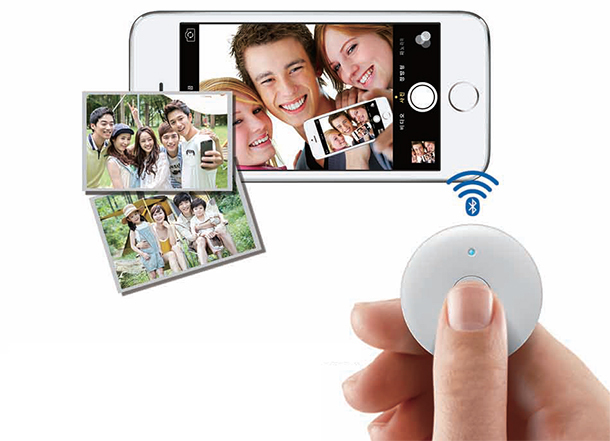 1409M09] Chois Technology, this year, prepared its very attractive smartphone remote camera shutter called Xelfie (model:XSC100) for global smartphone users. 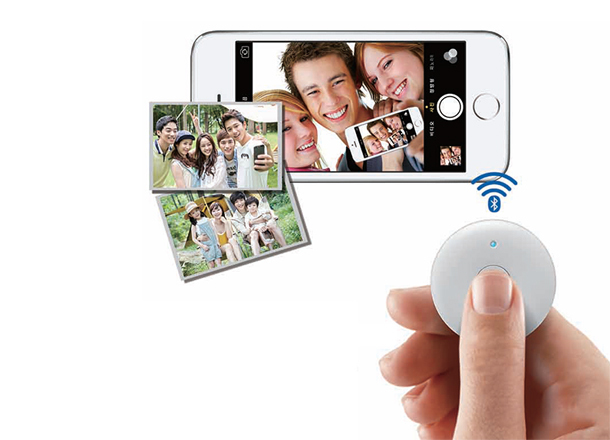 The XSC100 is a Bluetooth remote camera shutter and is available with built-in camera apps. It perfectly supports builtin camera apps for iPhone and Android. So, various models of smartphone users have no need to download apps. 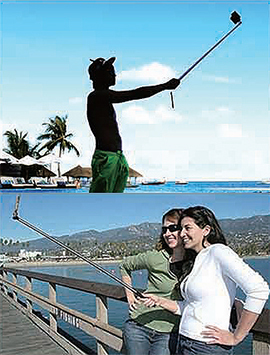 It is compatible with various camera apps. The users conveniently replace the battery. Xelfie is a simple Bluetooth fairing system for smartphone. The export performance of various models of Xpointer riding on steady good approvals from global major electronics-related exhibitions is being well publicized through such potential markets as Japan, Germany, Turkey, and the United States. on a steady pace of growth. Now, it occupies the top spot in the South Korean market in terms of market share and technological leadership. X-pointer mobile, the world’s first of its kind employing mobile functions, is a laser pointer using smartphones (mobile devices). Now, two versions – version supplying a function of touch pen with a form of portable case and another version providing clip-are ready for its global customers. is now significantly assisting client companies to accomplish success in their important business fields.